Port Deposit’s Main Street and wastewater treatment plant are located within the 100-Year Floodplain and are subject to regular flooding. The State of Maryland and US EPA have identified relocating the Port Deposit Municipal Wastewater Treatment Plant (PD WWTP) out of the 100-Year floodplain as a priority of the Chesapeake Bay restoration effort. The Town of Port Deposit, Maryland, is on a hillside, with beautiful views of the Susquehanna River and grand historic mercantile port heritage. But Port Deposit has been plagued by limited available area for infrastructure. 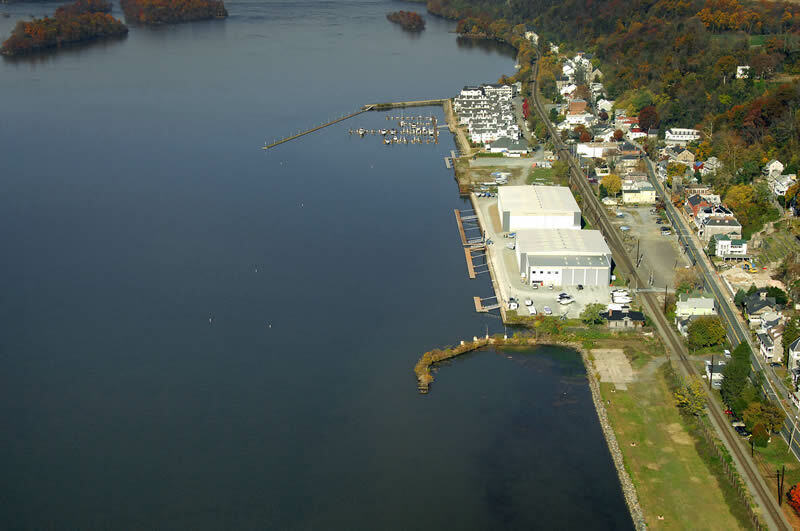 The Town of Port Deposit’s municipal wastewater treatment plant is outdated, served by gravity based sanitary system, and located on the only suitable land available. Port Deposit’s Main Street and wastewater treatment plant are located within the 100-Year Floodplain and are subject to regular flooding. 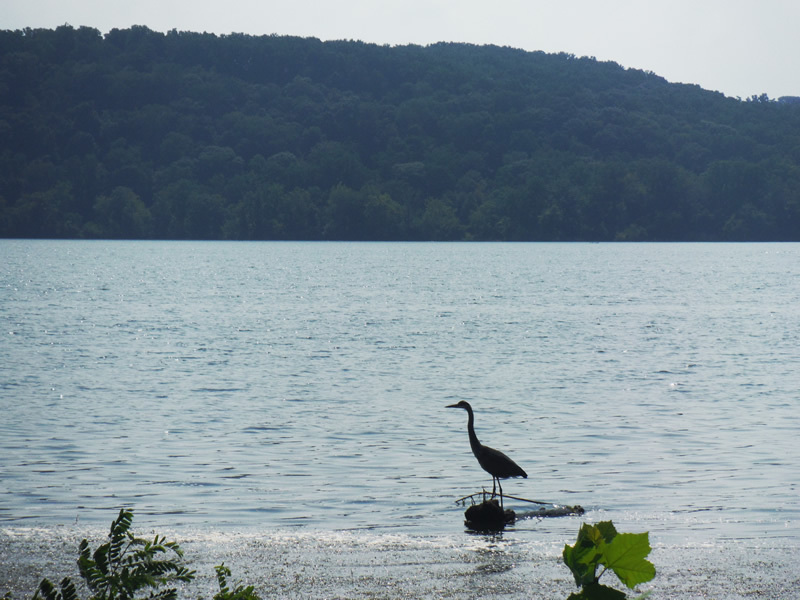 The State of Maryland and US EPA have identified relocating the Port Deposit Municipal Wastewater Treatment Plant (PD WWTP) out of the 100-Year floodplain as a priority of the Chesapeake Bay restoration effort. The Cecil County Department of Public Works led the effort to secure federal Bay Restoration Fund grant, to relocate the PD WWTP to a nearby reserve area at the Bainbridge Former Naval Training Center. The new PD WWTP site allows a larger facility than is possible at the existing PD WWTP site. The new PD WWTP facility also serves Chesapeake Bay restoration efforts by additionally converting more than 1,200 residential lots from failing septic systems to public sewer. Cecil County selected the nationally recognized environmental engineering firm of Hazen & Sawyer, P.C. to lead the preliminary design and federal grant funding coordination effort. 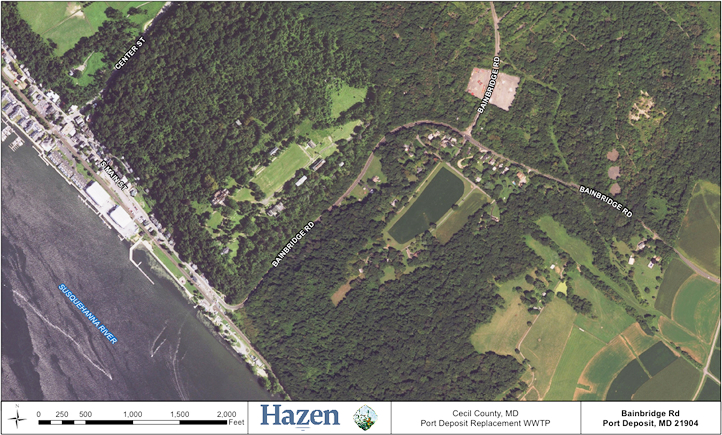 supported Hazen & Sawyer, by conducting environmental field studies for the proposed new site of the Port Deposit Wastewater Treatment Plant (PD WWTP). reviewed the Phase II Environmental Site Assessment data of the former Bainbridge Naval Center to assess contamination liability risks at the proposed new WWTP site. conducted Waters of the US Delineation and Forest Stand Delineation, and Forest Conservation Planning services for the 13-acre site. coordinated with the Maryland State Historic Preservation Office (SHPO) to assess historic architectural value of ruins located at the proposed WWTP area. prepared the USDA Rural Development (RD) grant-required National Environmental Policy Act (NEPA) Environmental Assessment (EA) report for the entire PD WWTP relocation; including new Main Street Sewage Pumping station, influent and effluent lines, and the new PD WWTP site. The project involved over 2-miles of gravity sewer and force mains and a new Sewage Pumping Station to expand public sewer service in the region of Port Deposit and the Bainbridge planned growth area. EnviroProjects efforts successfully satisfied USDA grant funding authorizations in less than 90 days.